I proudly use ATELIER PROFESSIONAL MAKEUP FOUNDATION designed & tested in France. 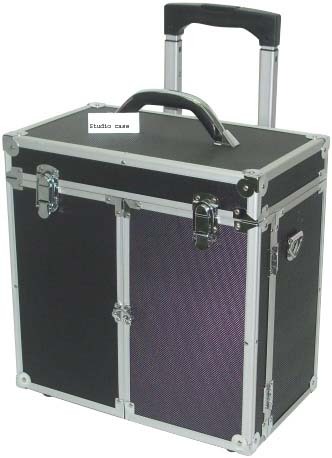 It is a Professional only product used in Photographic studios,TV & film. It is long lasting, making it an ideal choice for the Gold Coast or Brisbane BRIDE or your FORMAL makeup.It feels very light on the skin, looks very natural with great flawless coverage & waterproof for our climate. I also use some Latonas (used by Channel 10 Brisbane), Kryolan, Yaby, Senegence (USA kissproof lipstick) ,Laura Mercia & Mac. TESTIMONIES, just a few of the many 'thank you's sent to me from my beautiful clients. Hi Lois, I can't thank you enough for your mastery on our wedding day and for your generosity in staying back. It made all the difference in the world. Mike thought I looked beautiful and it wasn't the dress - I could not have looked prettier on the day and I felt like a million dollars! Thank you so much. I felt more beautiful after you made me up at our trial and more excited about getting married than I did when I tried my dress on - so as you can imagine I am so grateful to have had you as my makeup and hair professional.We are off on our honeymoon tomorrow for a well earned break. Thanks again......Paula and Mike.Wedding at Couran Point Island Beach Resort, South Stradbroke Is. I cater for all skin tones & skin types. My kiss proof lipsticks never fail. Plus long lasting hair products.You’ll look stunningly gorgeous all day long. I come fully equipped with everything that is required. All I need from you is a place to work with good natural light & a dining / kitchen table / bench to work from, need a power outlet. 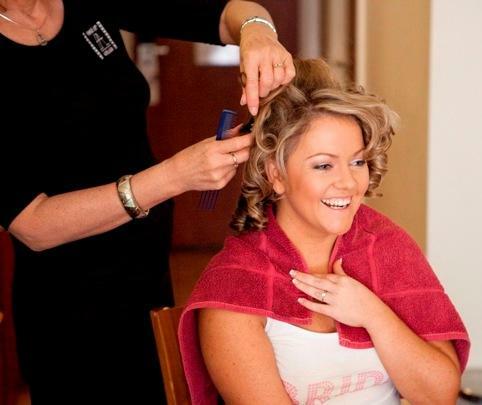 FOR LARGER WEDDING PARTIES, I have A GREAT TEAM of highly experienced Hairdressers & Makeup Artists who really enjoy working together making your day run smoothly in a relaxed & fun atmosphere. i personally look after the bride's hair & makeup, With large weddings, i sometimes attend to everyone's makeup & my colleague attends to all the hairstyling. We are all wedding specialists with many years of experience here on the Gold Coast & Brisbane as well as Sydney,Melbourne & Germany. My highly professional team will give you & your wedding party the very best individual attention. Trials are generally conducted at my home studio in Ormeau & takes about 2½ -3 hours for hair & makeup.Trials are an exciting experience and provide you with the opportunity to preview what your makeup & hairstyle will look like on your special day. I also take photos of your finished hair & makeup so that I have these to refer to, on your wedding day, formal day or special occasion day. There is never a ‘best’ time to have your trial. 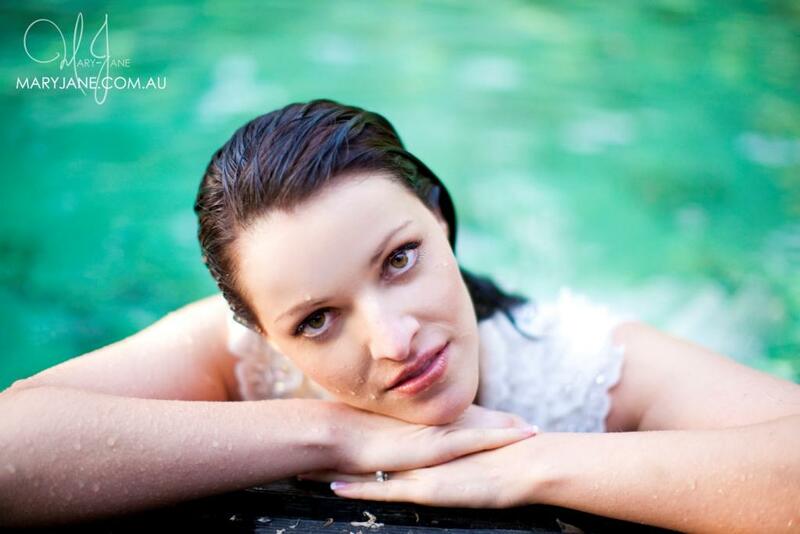 Many brides have the trial in conjunction with their hens’ night,other special events or their bridal gown fitting. Others choose to book their trial many months before their wedding & others are very impromptu with busy lives & are confident to just go ahead on the day. With over twenty years experience in hair and makeup, I can advise you on what will suit you best. I consider your facial shape, colourings, dress style, colour of flowers, bridesmaids’ colours and theme for your wedding. I will provide advice but not dictate, after all it is your special day and it is important to look how you want. And that means stunningly gorgeous all day long! You will always love your photos for years to come. mailing you a personalized SCHEDULE for your special day to ensure it is Smooth Sailing. I usually only commit to one WEDDING or one FORMAL per day to give my undivided attention to you. Some dates can be very popular where I may have 3-4 brides OR formals wanting that same day therefore I can book up quickly so I suggest booking early. It works on a 'first in,first serve' basis so don't be disappointed.WEDDING DEPOSIT $150 & FORMALS $75 DEPOSIT (non refundable if cancelled) will LOCK-IN your wedding/formal day, deducted off the total amount, to be paid on your wedding/formal day. I will send you payment details. So please contact me by phone or e-mail with your details. I am happy to alleviate any concerns you may have. Remember,you only get one chance at looking your best for that one day in your life.